The tibialis posterior tendon is a large tendon which arises as a muscle on the inside of the calf and becomes a tendon around the inside of the ankle, which then inserts into the arch. 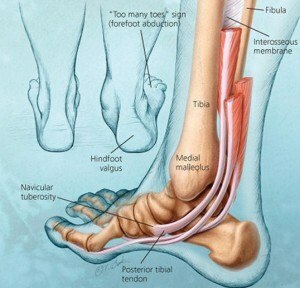 This tendon is responsible for maintaining the arch of your foot and is susceptible to trauma and injury. Pain around the inside of the ankle. Unable to complete a single leg tip toe. Pain on the outside of the ankle (sinus tarsi).